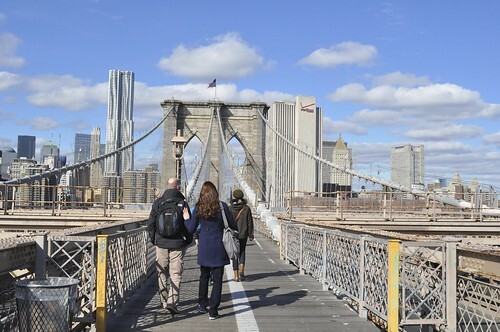 Walking across the Brooklyn Bridge has been something I've wanted to do in the city for the longest time, and now that I had someone to walk with (Marcus, of course), I could do it sooner! Marcus and I decided to wait until the weather cooled down from the heavy summer heat to nice and slightly chilly fall weather. Early November seemed to have been the best time for that. I've also been meaning to try that famous pizza place in DUMBO (i.e., Down Under the Manhattan Bridge Overpass) near the end of the Brooklyn Bridge on the Brooklyn side. 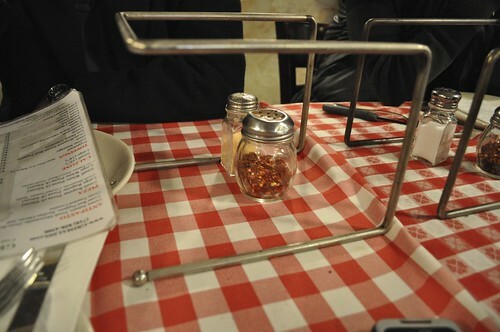 I found out it's called Grimaldi's Pizzeria. It was quite chilly that Saturday morning in November, but the sunny weather helped to counter the cold air. Luckily, it wasn't too windy either, so our walk was very pleasant. Photograph of the first tower! 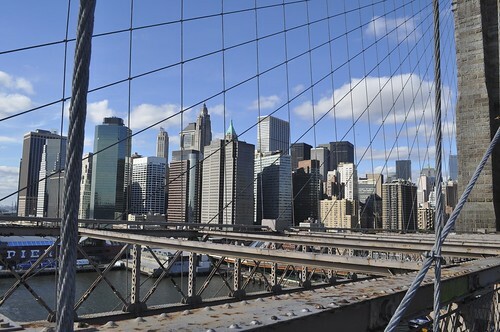 View of Manhattan from the Brooklyn Bridge. 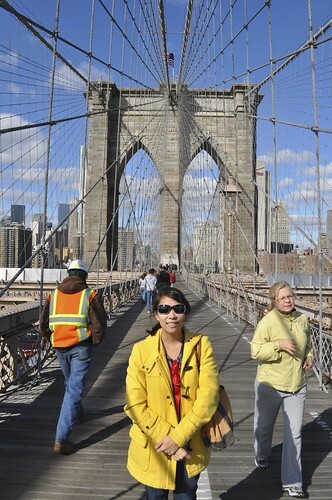 Me on the Brooklyn Bridge pedestrian walkway. At the middle of the Bridge. And we made it over in 25 minutes! 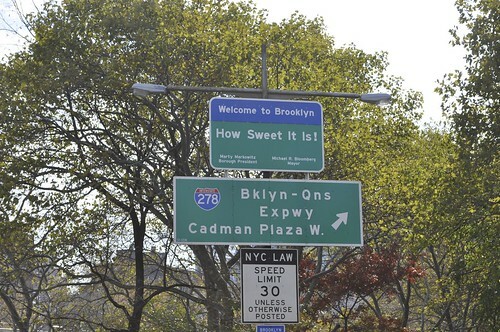 I love this sign--"Welcome to Brooklyn--How Sweet It Is!" We made it to Grimaldi's around 1 PM. 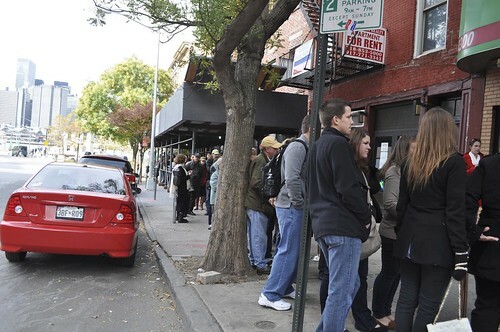 And here was the line at that time. And just some information in case you plan on making a stop here--it's pies and cash only! 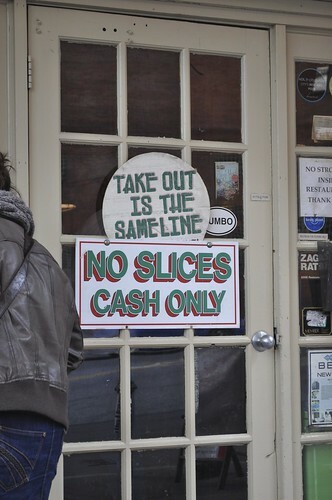 Also, many people order take-out for pick-up so the wait isn't so brutal, but when the sign outside reads what it says above, you'll have to stand in line with the rest of the eager pizza eaters. 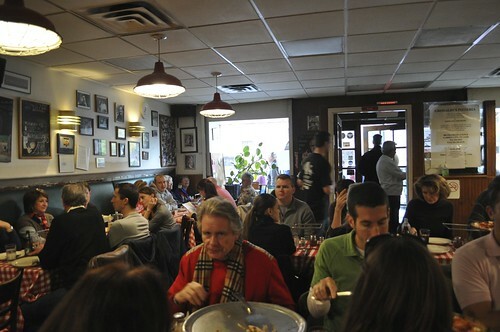 After waiting about 45 minutes in the cold, we finally made it inside the pizzeria. As you can see, it's located in a very modest-sized space, but don't let that fool you. The turnover is very quick! The tables ladened with red checkered picnic-style table cloths, making for a very relaxed and homey environment. 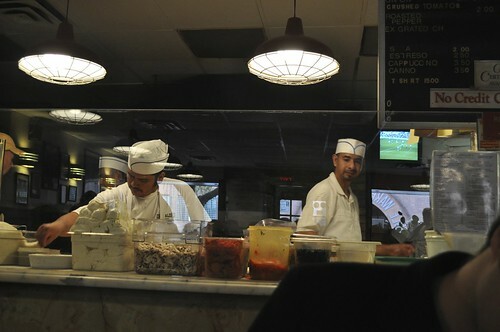 The guys working the pizzeria's magic, churning out pies like a factory conveyor belt! Marcus and I ordered a large (16-inch) pie with mushroom and pepperoni (an order of 8 slices). The medium pie was only 2 inches smaller in diameter, and since the large-sized pie was only $2 more, an additional two more slices was well worth it. 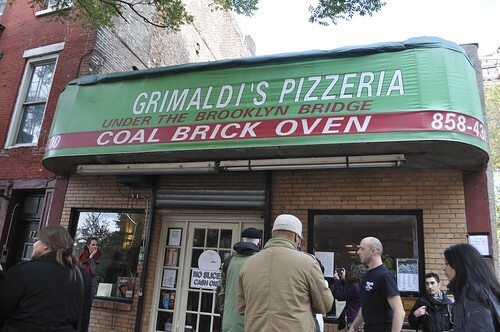 The pizza from Grimaldi's is a coal-fired in a brick oven, which gives the pizza a nice smokey flavor as well as an extra crispy crust. I also liked that the slices were thin, so we could eat more pizza without the worry of filling up on too many carbohydrates in two slices. 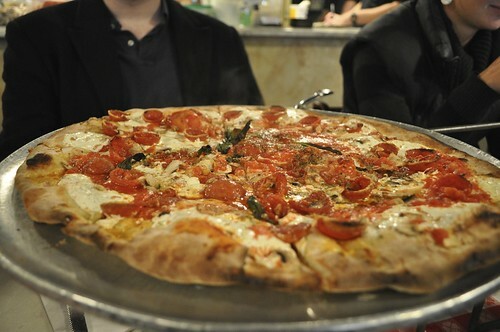 Grimaldi's uses fresh mozzarella, crushed tomato, and basil in its original pizza pie (as opposed to its white pizza pies which have no tomato but is compensated with extra cheese and fresh garlic). The mushrooms on our pie were sliced thin, which I really liked because the slices were not at all soggy. Mushrooms typically release moisture as they're being cooked, so ordering them as pizza toppings can lead to soggy pizza if they're fresh mushrooms sliced thickly. 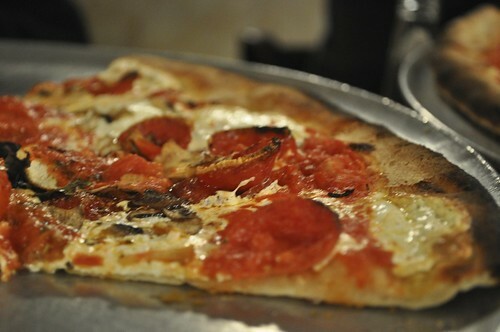 Anyway, while mushrooms remain my overall favorite pizza topping, the pepperoni from Grimaldi's takes the cake. As seen in the above photograph, the pepperoni toppings are smaller in diameter and thicker in slice than the ones I'm used to seeing. They even curled up like suction cups! Being so, we were able to get the hearty pepperoni flavor from the thicker slices and were somehow less greasy. The circumferences of the pepperoni (i.e., the part that flipped up into a suction cup shape) were crisp and toasted, giving the topping an added dimension of smokey flavor (mostly resembling really crispy bacon right off the skillet). Additionally, the dough used in creating these pies are light, so the dough portion of the pizza didn't seem to fill up as quickly as it normally would. 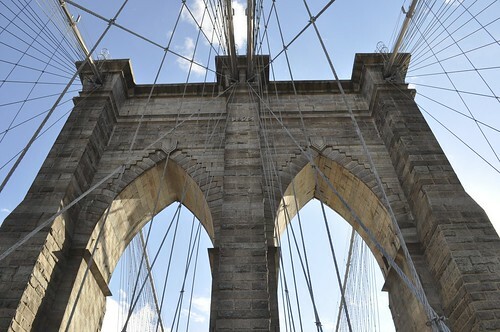 Findings: I really enjoyed the walk over the Brooklyn Bridge! 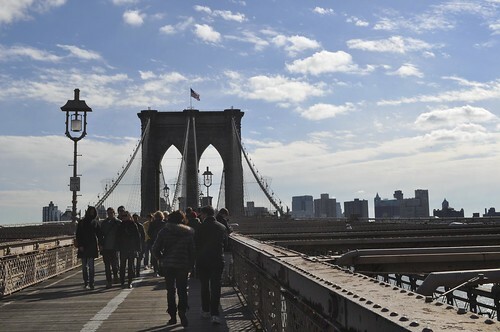 DUMBO seems to have a lot of food hotspots worth visiting--I'd definitely love to go back when it gets warmer to pay a visit to the Brooklyn Ice Cream Factory and DUMBO's General Store. Anyway, Grimaldi's made for a really good lunch to look forward to after trekking across the Bridge into DUMBO from Manhattan. I think the value you get for the price is well worth the trip! A thin crust, smokey flavor, fresh pizza ingredients, and quality toppings--can't go wrong with those with regards to pizza! I would advise going earlier to avoid lines or ordering take-out to eat outside on a nice day. This makes for a great place to take out-of-town guests as you can entertain them with some sightseeing and some authentic New York pizza. I look forward to making another visit this coming spring! Price point: $14 for a large regular pizza, $2 each for pepperoni and mushrooms.